In gallery is 158 species and 691 photos of beetles. For more photos check beetle gallery. The rhinoceros beetles are a subfamily (Dynastinae) of beetles in the family of scarab beetles (Scarabaeidae). 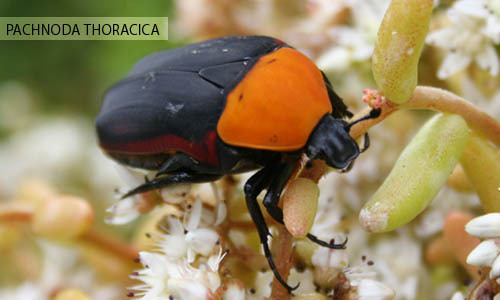 They are among the largest of beetles and are so named because of the charactertic horns borne by the males of most species in the group. The male beetles use their horns in mating battles against other males. Their larval stage is long, several years in some species. The larvae feed on rotten wood while the adults feed on nectar, plant sap and fruit. Rhinoceros beetles are also the strongest animals on the planet, proportionally. They can lift up to 850 times their own weight. Cyphonisthes vallatus septentrionalis (?) New! Dynastes hercules morishimai F1 New!